Mohamadnia, Z., Ahmadi, E., Ghasemnejad, M., Hashemikia, S., Doustgani, A. (2015). Surface Modification of Mesoporous Nanosilica with [3-(2-Aminoethylamino) propyl] Trimethoxysilane and Its Application in Drug Delivery. International Journal of Nanoscience and Nanotechnology, 11(3), 167-177. Z. Mohamadnia; E. Ahmadi; M. Ghasemnejad; S. Hashemikia; A. Doustgani. "Surface Modification of Mesoporous Nanosilica with [3-(2-Aminoethylamino) propyl] Trimethoxysilane and Its Application in Drug Delivery". International Journal of Nanoscience and Nanotechnology, 11, 3, 2015, 167-177. Mohamadnia, Z., Ahmadi, E., Ghasemnejad, M., Hashemikia, S., Doustgani, A. (2015). 'Surface Modification of Mesoporous Nanosilica with [3-(2-Aminoethylamino) propyl] Trimethoxysilane and Its Application in Drug Delivery', International Journal of Nanoscience and Nanotechnology, 11(3), pp. 167-177. Mohamadnia, Z., Ahmadi, E., Ghasemnejad, M., Hashemikia, S., Doustgani, A. Surface Modification of Mesoporous Nanosilica with [3-(2-Aminoethylamino) propyl] Trimethoxysilane and Its Application in Drug Delivery. 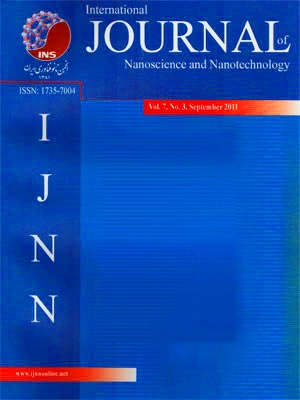 International Journal of Nanoscience and Nanotechnology, 2015; 11(3): 167-177. 2Department of chemistry, University of Zanjan, Zanjan, I. R. Iran. 3Department of Textile Engineering, Center of Excellence in Textile, Amirkabir University of Technology (Tehran Polytechnic), Tehran, I. R. Iran. Mesoporous silica nanoparticles with unique structure (SBA-15) were synthesized and modified by [3-(2-Aminoethylamino) propyl] trimethoxysilane (AEAPTMS). The synthesized nanoparticles were characterized by TGA, N‌2‌ adsorption, SEM, FTIR, CHN elemental analysis. The total weight loss for the modified SBA-15 is 15.2% and thermal analysis revealed that 1.5 mmol AEAPTMS/1g SBA-15 had been grafted. The modified particles were used as a drug delivery system. Ibuprofen as common nonsteroidal anti-inflammatory drugs was used to evaluate the controlled drug release properties of modified SBA-15.The results show that the modification of SBA-15 with organic groups such as [3-(2-Aminoethylamino) propyl] trimethoxysilane and (3-aminopropyl) triethoxysilane (APTES) improve the organophilicity of the SBA-15 and the drug loading efficiency. The results of drug delivery experiments reveal that the surface modification of SBA-15 with amino groups significantly decreases the drug delivery rate. The data obtained from the in vitro release studies was used to evaluate the kinetic mechanism of release; the initial 60% release of drug at pH 7.4 fits with the Korsmeyer – Peppas model, when diffusion is the main drug release mechanism.